Drinking green tea, and its cousin black tea or oolong tea, has been a custom in many countries for thousands of years. The tea is made from the leaves of the Camellia sinensis plant. Everyone world wide enjoys a good cup of tea, however the benefits of drinking tea are not as wide- spread as they could be. Tea is without a doubt good for your health, helps with high blood pressure, keeping your heart ticking, aids in blood flow, keeps your bones strong, reduces your waist line, gobbles up belly fat and helps clean your kidneys plus a few more but I think you get the drift. There is a difference in color between teas. This is a by-product of production. Green tea is the same as black tea however black tea is left out to ferment while drying. This process changes the color to black. It is a milder tasting tea and I would assume why it is a bit more popular. Oolong ferments about ½ the amount of time black tea ferments. Green tea is steamed and then let dry to keep the flavor intact. Green tea has nutrient rich properties that other beverages do not possess. It is rich in certain phytonutrients called catechins. This nutrient contains many different compounds but in an average cup of tea it provides about 125 mg of catechins. Green, black and oolong tea possess health benefits as stated above. The phytonutrients or catechins found in the teas act to eradicate free radicals from your body. These free radicals are believed to be precursors to many health problems in our society. Green tea is however more powerful in this area than the other two, because the amount of catechins in green tea is more then double. Teas do have a positive effect on reducing high blood pressure. Drinking just one cup a day can reduce your chances of high blood pressure by 80% according to a new Chinese study. Your heart also benefits from tea consumption. Tea helps keep arteries clear and reduces cholesterol. Both have an enormous impact on longevity. Studies show that drinking 2 cups of tea per day can extend your life by 40%. Now that is worth thinking about. For the women out there reading this you will also enjoy the simple fact that drinking tea strengthens and increase bone density. This really helps postmenopausal women. Just make sure you get your calcium and vitamin D everyday in addition to drinking green tea. Now the best part about green tea, or all teas mentioned above in my opinion, is their ability to reduce your belly line. The least appreciate value of green tea is its catechins ability to interfere with fat digesting enzymes in the stomach and small intestines. This results in incomplete digestion of fat lipids. This leads to fewer fats absorbed by the intestinal tract and more elimination of fat lipids. It has another benefit as a fat storage inhibitor. It also helps the body transfer from sugar burning to fat burning. This improves the belly line as you use more fat for energy. The increase fat burning is contributed to “thermogenisis” or heat production by your body. You can lose over a pound a month just by drinking a cup or two of tea per day. Now couple that with a good nutrition plan and exercise plan and you are in business. There is evidence that stress and depression are associated with increased abdominal fat. Stress and anxiety plus depression increase the stress hormone cortisol. This hormone aids in the collection of body fat in the abdominal region. 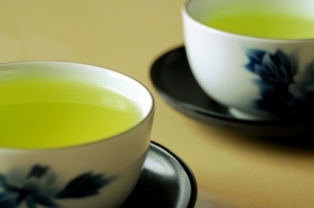 Green tea seems to have amino acid, which counteracts cortisols effect. The amino acid is called L-theanine. I really need to switch that cup of coffee I have in the afternoon with a cup of green tea. Do you need to brew a fresh cup to get the benefits? I know there are a lot of green tea drinks out there, but I never know how much tea there really is in any of them. .-= JoJo´s last blog ..Melissa And Doug Corner Kitchen $59 =-. I recently read an article that said you can increase the absorption of Catechin, (the part of green tea that is good for you), by adding citrus to the tea. Turns out 80% of the Catechin passes right through you without being absorbed. Adding citrus, like a lemon, increases the absorption rate by changing the acidity of your intestine. Just a little FYI. Increase the absorption rate of green tea catechin by adding citrus to it. Hadn’t heard that. I’ll look for more information on that and see what I find. Do you have a source that would shorten my search? Here are just a few, there are many articles about this discovery. .-= BlueKayak´s last blog ..The Importance of B Vitamins and Serotonin =-. Beyond just losing fat, I believe Green Tea is really essential for your body, providing all that anti-toxins which can really help you be fitter and healthier. i love to drink green tea, but in the gym they told me it has a negative effect on testosterone levels. do you know if that’s true rob? Yeah GT is great! Tooo bad it tastes so awful! Great post. I love some tea. What’s everyones favorite types of exotic teas? Just a little side note, CLA from red meat can help burn belly fat as well. Does decaffinated green tea have the same effect? Lisa, from what I know about the decaffeination process, it’s done with chemicals. Personally, taking a perfectly good creation and then running it through a chemical process is not something I’d want to consume in the end. I could not find a credible resource to direct you to in regards to the health benefits being lost in decaffeinated green tea, but I did find something about removing a good portion of the caffeine at home. The theory is that most of the caffeine is released in the first 30 seconds of steeping (it’s a theory at least). So, prepare your tea, steep it for 30 seconds, pour off the beverage, and then add more hot water and steep for desired length of time. If it’s a true green tea, with all the health benefits associated with it and it happened to be packaged by nature with a little caffeine, I’d trust it the way it is. I doubt that drinking lemon with green tea will do anything to the acidity of your intestines. The lemon has to pass through your stomach. Your stomach is full of acid which is a factor stronger than the citric acid you’ll ingest from the lemon. What lemon does do is make green tea taste really nice. Better than coffee. I’ve been drinking green tea for 5-6 years at least 2-3 cups a day. It is great. It gives you energy and makes so feel good as well as boosting your immune. I can tell you that it does not promote weight loss. Trust me. It gives you energy and health to help exercise and use your body. But just drinking tea is not going to “gobble up fat” and I also don’t know about the Chinese blood pressure study. I suggest strong Sencha, it also works like flax, cleaning the pipes and all. @bob, no way. It actually does the opposite. If you are concerned about that, by natural, organic w/o chemicals on the plants. Nice article! Green tea speeds up metabolism, hence the fat around your belly (which accumulates there generally because of slow metabolism) melts away. 1 tablespoon of green tea, few whole black peppercorns, fresh ginger, cardamon and lemon zest. Add 2 cups of water and bring to a boil. Then cover and wait 5-10 minutes. Add 1 teaspoon of honey. It is refreshing, stimulates digestion, provides vitamins and minerals, and help to burn fat. @Marina, your green tea recipe sounds incredible. I love green tea and I love what you’re doing with it there. I love black pepper, ginger and cardamom. Will have to give your green tea recipe a go for sure! @Bob, sorry I missed your comment earlier about green tea having a negative effect on Testosterone. I see that @Meghan answered it correctly. Green tea would only improve Testosterone. I don’t like the taste of green tea alone so I would add fresh lime juice and honey. But I’m not getting the results I expect. What would u recommend? i tried drinking green tea at least once a day. it’s calming. unfortunately, after a couple weeks, i need to stop it due to hyper acidity. any ways to reduce its acidity? Help, I have been trying to shed oe weight for 3 months, I must be doing it all wrong at th gym as I have gained 9 kilos. @Muzza, if I hadn’t changed anything except started going to the gym and weight training and gained 9 Kilos (20 lbs), I’d be very very happy. That’s what exercise does… it puts on muscle. Throw away the scale and start measuring yourself instead. You want to drop body fat, not body weight. In other words, you want to gain weight, lose fat. I dont know what else you’re doing, so pretty hard to give any advice. If you’re new to weight training and have the right hormonal picture, you’ll gain weight at first as you build muscle, then you’ll burn fat. Do you have any recommendations on which green tea to buy? Im in so cal and there are tons of brands on the shelf. I just want to get the most potent one available. Which green tea should you buy? Good question. As far as I’m concerned, the top green tea’s are the loose leaf teas that you have to use a tea ball or tea diffuser. doMatcha is a brand I like to use. Here’s a link to my Amazon Store about Green Tea so you get an idea of what I’m talking about. I’ve been drinking Sunrider Calli tea and Fortune Delight tea for almost 20 years now as a rule, but they’re an network marketing company and when people hear MLM, they tend to freak out a bit. It’s not different than shopping online anywhere else, but the products tend to be a lot better. With Sunrider, you need a sponsor to be able to join with a membership and place your own orders. IF you like, I can refer you, then you can just order Sunrider Calli tea on your own. It’s a lot different. Calli tea actually nourishes the cleansing organs and is an alkaline forming beverage. Good stuff. Hi Rob, first of all thanks for all the information you provide. I am a 48 years old mom of 5 kids. Couldn’t lose weight after my 5th pregnancy. I am struggling now since 6 years, but I can’t get rid of the weight I put on. I am drinking 3-4 mugs of green tea every day, but my weight doesn’t change. I need urgend help ! Please ! I forgot to mention that my blood sugar and cholesterol is normal. the only problem I constantly face is fatique. I have been trying to switch from my regular coffee habit to green tea. Obviously there would be a lot of benefits including weight loss help. Maybe I’ll start by going to the milder black tea to make the transition easier. I guess I’m kinda lazy! 😉 I drink the diet green tea bottled by Lipton. I have been drinking it for several years now! I may have to try some higher quality green tea in the near future! I drink about 3-4 liters of water a day. I usually put 1 GT bag in a 1 liter bottle of water, and drink that for a few hrs, when done I do the same thing again, until i go through about 4 of those. BUT I drink it at room temp. Will that give me the same effects? My Chinese friend gave me some of the best green tea as a gift. I tried drinking it, but I couldn’t stomach it, which is a shame because I’m want to reduce more body fat before increasing my muscle mass. Is there any way to make it taste better? Anyway, the effects sound really good, so I might try again. I’ve still got the tea, so it’d be a shame to let it go to waste. I just started drinking green tea about a month ago, is their such thing as drinking too much green tea. How much is too much? With all these benefits it is certainly a drink that is worthwhile having on a regular basis! Thanks for info, GT helps me much! Green tea is everything it’s said to be and then some. Drinking green tea regularly aids weight loss like nothing else. I learned, first hand, that it can be your best friend when you’re taking off unwanted weight. For those who can’t quite get accustomed to the taste, Truvia or Stevia (natural sweeteners) may help you along. You might like to add a full packet the first week, then half a packet the second, and try no packet after that. Your taste buds will adjust and, trust me, they’ll come to CRAVE green tea!! Agree with most of the comments made here. Green tea combined with a sensible diet will keep you fit. I just wanted to share my experience with a product made of Green Tea, Yerba Maté, and some botanicals. It is called Sai’Tea. It is from Chile, and is just being sold here. This is truly all natural, nothing extracted, isolated, or added. It does not stimulate you central nervous system, or effect lipid uptake (no liver problems. In fact, the only caffein in it occurs naturally from the tea & maté. It works 2 way, first it subtly curbs your hunger. Second, it drastically reduces the amount of food you need to feel full and satisfied. You simply feel full with less food. I have been able to eat about 1/2 to 2/3 of the food I normally eat. The best part is, I really don’t miss it! No B.S. it really works! I think these guys may have found the perfect lifestyle modifier to loose weight, without going into cardiac arrest, or needing a liver transplant. I have been using it since December, without any exercise but walking 2-3 times a week, and have lost 28 lbs. Not the fastest weight loss, but slow and steady, and I can still have REAL food! Do you know how to judge the quality of green tea? Where is the best place to buy it for optimal nutrient composition?